James Hall has come a long way since a summer’s day in 1999 when his late father Steve walked him through the gates of The Lawn for the first time as a young boy. After moving to Northern Ireland from England, the Hall family’s first cricketing port of call had been Queensway, Derriaghy a previous Tuesday night but unfortunately for Derriaghy, it was their senior practice, and James and Steve were told to come back another day. Derriaghy’s loss soon became Waringstown’s gain. Michael Scott, the then Waringstown opening batsman and the coach in charge of their summer school, identified James’ rich potential almost from the moment he first saw the youngster hold a bat. Sixteen years later, last summer Hall was breaking batting records for fun, piling up 1,140 runs, including two double-hundreds and another three centuries. As the records tumbled, you might assume that Hall would also have been starring for Ireland and the Northern Knights - you would be wrong. The last of Hall’s eight international caps came in 2010 and after just a solitary game in 2013, he cut ties with the Northern Knights, probably never to return. It’s not as if he’s isn’t capable of returning to the top stage. The 27-year-old battled weight loss earlier in his life, but now he bears no resemblance to the chubby teenager who was thrust into Ireland duty before he was probably mentally, physically or technically ready. Now his biceps bulge, the sixes he plundered last summer and the longevity of those innings testament to a gruelling gym routine. He might be more ready now for a representative career but don’t bet on it happening. Hall’s life hasn’t been easy. Steve, such an influence on his cricket and in his personal life, died in 2007, tragically never getting the chance to see his older son reach the full Ireland side in 2008 or watch the destructively brilliant club batsman that he has become. The gap he left hasn’t been easily filled. “If I was going through a bad time in cricket, or life in general, I could always go home and have a conversion with him, and he would have made me feel better about it,” Hall explained. “He was very successful in business, he had started at the bottom and worked his way up, so he always had a very level-headed view on everything. With him being sick, he always said, cricket is something you play because you enjoy it, it’s not a life or death situation. It was definitely was a difficult time after he died to get my head back round what I wanted out of cricket and what I wanted out of life. After last season’s achievements came an approach from CIYMS for Hall’s services. Hall was tempted by the move to Belmont but quickly made his decision. “Everyone at Waringstown has been great to me and my family through everything, through my dad dying and tough times at home, people have always been there for me, if I ever needed anything I only had to ask. 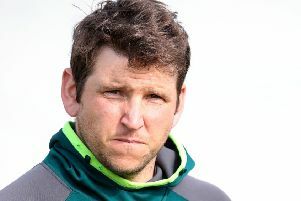 Hall has forthright views on the Northern Knights and makes considered observations about the make-up of recent squads with a large contingent born outside the NCU. “I was involved in the first game and first few practices of the Knights and it was exciting to see something new starting. But work commitments and not having to take every holiday to play cricket was my reason not to get back involved. “James Shannon has just started working with me, he’s been in just over a month and he has just two days’ holiday left to take for the rest of the year because he’s taken them all for cricket. Hall retains fierce personal ambition. The first target is to become Waringstown’s most prolific century-maker. He is tied currently with Kyle McCallan.